A native of southern Europe, lily leek has long enjoyed a rich past. It is said to be the “Moly” that saved Ulysses from the charms of Circe as described by Homer in the Odyssey. Even if it does not have magical properties, it is a fine garden plant and is a good addition to the front of the border, a rock garden, or cottage garden. 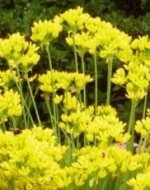 The bright yellow flowers bloom in late spring and last 2-3 weeks. The foliage grows about 12” high and remains attractive all summer. Lily leek is easy to grow and a few bulbs planted in a sunny well-drained site will multiply rapidly, but never become a nuisance. Bloom: Small yellow flowers or produced in loose umbels 2” wide in late spring to early summer. Foliage: Flat, lanceolate, blue green leaves 2” wide and 8-12” long are produced in pairs. Outstanding Selection: ‘Jeannine’ (flowers earlier and produces larger umbels on sturdier stems).